African violet plants are a great addition to any home. They look beautiful and they flower all year long when properly taken care of. The keyword here is “well taken care of”. The first step to this is to find the right pot. Getting a good pot for your plant can make a huge difference. We took our time to narrow down and review what we consider to be the best pots for your African Violet. For first time learners, the self-watering mini pot by Window Garden is best. It comes with seedlings for you to practice on and enough fiber soil for your pot. It’s not great for a mature African Violet plant, but great for a mini violet. Another great option for first timers and experienced planters alike is the Aquaphoric Self Watering planter. In our humble opinion, this one is the best of all 5. It has some fiber soil to help kickstart the growing process. It also includes a self-watering system (a passive hydroponics system and water level indicator) to help make watering easier. It also comes in many colors giving you more choice. 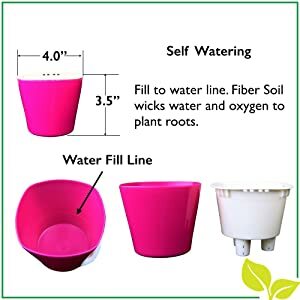 The 3-pack provided by the Vencer self-watering planter is just as good of a choice for your home with its sleek and minimal design. The great part is it’s a pack of 3, so you can repot to bigger pots as the plant grows. The pot from Vencer doesn’t offer much in terms of the water system. Other pots use a passive hydronic system and a water level indicator for water management. The pots from Mkono are great, but don’t offer anything unique. The pot is durable as it uses plastic that is non-corrosive and water resistant. The aesthetic and size of the Aquaphoric garden hub tub makes it blend and look good in any room. The pot comes with enough fiber soil to give you a head start, but the size of the pot also limits the size of the African Violet plant that you’ll use. Many of us love having indoor plants in our houses. They add some spark or even beauty to the house. The African Violet Plant is a beautiful plant that can add some color and style to any room in your house. The plant is rare in that it can flower continuously throughout the year. Be it winter or summer, it’ll still be flowering. Of course, like any other plant, the African Violet needs some attention. There are some requirements/conditions that you need to meet to have your plant in peak condition. The good news is that this indoor plant is one of the easiest to maintain. All you need to do is to keep it at the right temperature and avoid direct sunlight. You also need to keep it evenly moist at all times. You can use a self-watering pot or an African Violet Pot to achieve this. Don’t forget the fertilizer, these plants love fertilizer (African Violet fertilizer). This pot is designed for people with and without a green thumb. Don’t worry about your expertise level when using this pot. In fact, they even provide seedlings (3 germination bags) to help with the learning process. 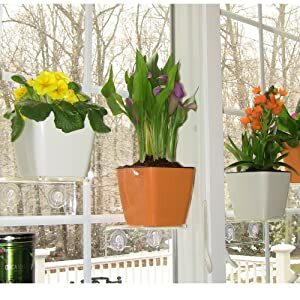 You just need to place the bag over the pot and watch them grow. Don’t forget to remove the bag once the seedlings start to grow. The pot is self-watering making it easier to manage the water level in the plant. You can choose to utilize the fiber soil that comes with the plant or use your own as well. The sleek design and color variety of the pots also makes it a great choice for any room. 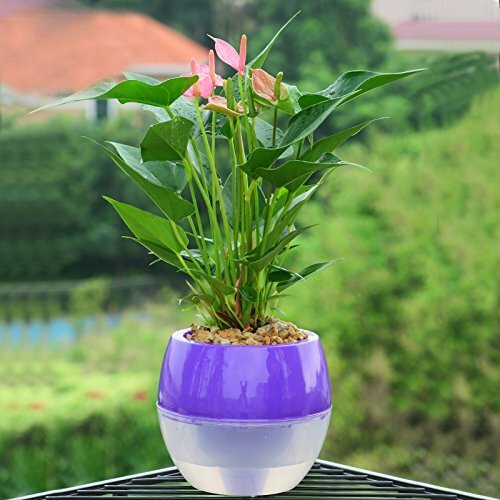 The Aquaphoric planters are made to make planting easier for you. The 1-quart fiber soil that comes with the purchase gives you a head start. Fiber soil is good for your plants as it allows the roots to stretch and grow easily. This pot also uses a passive hydroponics system that makes sure your plant gets just the right amount of oxygen, water and nutrients. Being a self-watering system, the pot helps you reduce the frequency at which you water your plants. This one is a bit different from the other pots in this list. The main difference is that this is a pack of 3 pots of different sizes rather than just one. It’s a self-watering pot, so your plant is well taken care of (as far as water is concerned). It also has a bottom layer to store excess water, but be warned. The water should not exceed the visual water window. The minimal and sleek design of the pots makes them a great addition to almost any room in your house. The maker of this pot is trying to bring green living to people’s homes, with these pots they might succeed. Like every other pot on this list, it’s a self-watering pot. This makes it great for plants that require a steady stream of water like the African violet. We almost forgot to mention the double layer design that allows the pot to store excess water at the bottom. The pot is also made of high quality plastic that is strong, durable and resistant to corrosion. This pot is touted as a great gardening gift, you’ll see why once you have a look at what it has to offer. 6 quarts of fiber soil is included with purchase. The soil has large enough air pockets for the roots to breath and absorbs enough water to keep the plant hydrated. With that said, you’ll still need fertilizers as the nutrient level in fiber soil is low. The pot is also self-watering and has a water level indicator. The indicator gives you a good idea of when to water your plants and how much watering is needed. We almost forgot how good the pot looks. It’s small in size and aesthetic, so you can place it on a countertop or window sill. African violets are delicate. You need to get everything right in order for the plant to bloom. One of the important choices that you have to make is on the pot. You need to decide what type of pot you should place your plant in. Your choice will affect how you’ll care for the plant and the chances of it blooming. You have 3 main choices, an unglazed terra cotta (clay) pot, cheap plastic pots and self-watering pots. They aren’t the best-looking kind of pots, but they are great for use in both indoor and outdoor gardening. Using these kinds of pots does come with its advantages. For a starter, they are very porous. Great for letting the water go through the pot, thus giving your plants a good soak. On top of that, they’re great for quickly shedding excess water due to the quick evaporation it provides. With that said, using these pots with your African violets might mean watering more frequently. This is because of the quick evaporation that might leave your plant dry. There is also the issue of mites and bacteria (that can harm your plant) being able to hide in the pores of terra cotta pots. Not every plastic pot will have a saucer attached to it. These types of pots are made out of some kind of plastic. They have a drainage hole at the bottom with a saucer. This gives you the option of watering from the top or letting the plant get water from the saucer. It’s a great choice of pot, but it needs checkups every 30 minutes to an hour and after watering. This is due to the excess water that might build up on the saucer. African violets love water, but too much of it can be harmful to the plant. This in itself is a broad category. 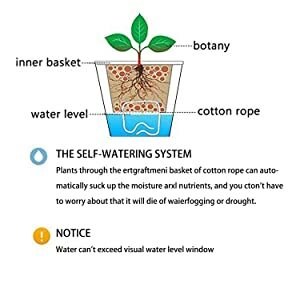 There are different types of self-watering pots. There are the ceramic self-watering pots, the dandy pot and the oyama pot. The ceramic ones tend to be beautiful and come in different colors, shapes and sizes. They normally come in two pieces, the bottom part being a reservoir (glazed ceramic) and the top part, to hold the plant (porous unglazed ceramic). On the other hand, dandy pots tend to come with a see-through reservoir and looks like an inverted top hat with a ruffled brim. The Oyama pots tend to be the least expensive of the three. You could also choose to implement a wick system, if you have the time and patience to make one yourself. 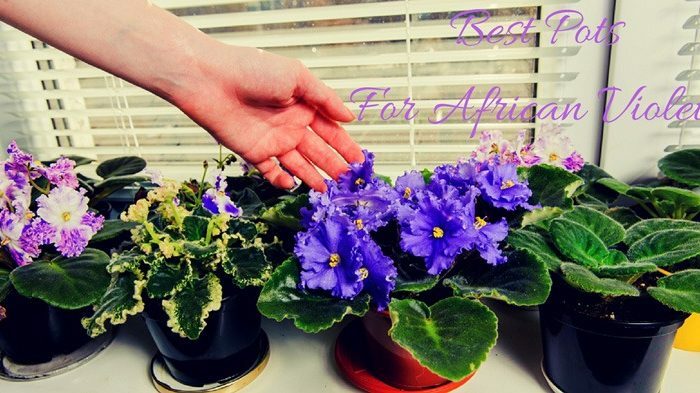 Which is the Best One for Your African Violet? The answer to this is subjective. It all depends on your needs and personal tastes. Clay Pots and Plastic Pots have their benefits and drawbacks. It’s a matter of you picking what you think we’ll work best for you. This is when you move your African Violet from a smaller pot to a bigger pot. Many experts recommend that you repot your plant with fresh soil, twice a year or even more at times. When is the right time to pot up? This is when your plant has outgrown its pot. You’ll know this because the roots will be growing out of the rootball. Potting up requires some expertise to do it right. One of the more common methods of potting up is mold potting. In this method, you reduce the potential for shock by compensating the difference in soil height. For instance, if the old pot was 2 inches in height and the new one is 3 inches, the difference is 1 inch. With this in mind, you’ll place one inch of soil at the bottom of your new pot. You need to know that there is more to consider when mold potting. If you know what you’re doing. It’s a quick and easy process that takes little of your time. You don’t always have to move your plant to a bigger pot. There are times when you have to move it to a smaller pot. Potting down is when your African violet is too small for its current pot. How do you know you should pot down? When your plant doesn’t form a cohesive rootball or when the soil is always soggy despite the pot providing proper drainage. The best advice we can give is for you to go for the next smaller sized pot. Don’t get too small of a pot as that won’t be good for the plant. Potting down is a bit more complex than potting up, so be cautious. Unlike the previous potting method, this doesn’t involve moving your plant to a smaller pot. In this method, you’ll be using the same pot. You should use this method when the African Violet becomes elongated. The elongation might be because of a nutrient imbalance or disease. The oldest leaves/bottom most leaves are the ones that get affected and die off. This leaves the neck (stalk or main stem) exposed, thus appearing elongated (more than a ½ inch long). The good news is that this method is easy to do and relatively safe for your plant. You also need to know about “bagging a plant”. It’s best to do this after repotting your plant as it helps increase the humidity. This helps reduce the transplant shock that your African Violent plant will experience. All you need to do is take a clear plastic bag that is large enough to accommodate the plant. The bag should be large enough such that it won’t destroy the leaves or stem when placed on top of the plant. Seal the bag on the plant and leave it there for a week. That’s it, once the week is over you can go on with your normal plant care routine. There are many great products available on the market, but you can use our list to make the search process easier. Any of these pots qualify as best pots for African Violets. The Aquaphoric herb garden tub is great, but it’s size limits it to small plants, so you can’t let your African violet get too big. The self-watering plant for Mkono can work for your plant, but it doesn’t have the best watering system. This can be a problem if you’re away from your plant for too long. Apart from that, it’s quite basic when compared to the others on this list. The self-watering plant from Window Garden is the perfect, but small. This makes it terrible for when your African Violet grows bigger. 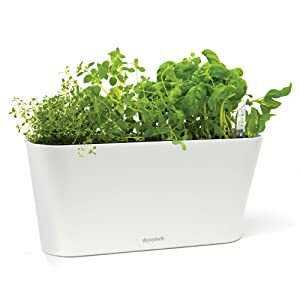 We found our winner, the Aquaphoric self-watering planter to be perfect as it’s the perfect size and has a good watering system to keep your plant alive and well for long.